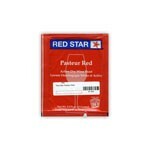 Red Star Pasteur Red Yeast - Texas Brewing Inc.
Pasteur Red yeast guarantees a fast start of the fermentation process. The Pasteur Red yeast strain guarantees a fast start of the fermentation process and it takes an immediate upper hand on the indigenous flora already on grapes. It has good alcohol resistance (up to 15% vol.) and can present a complete and regular fermentation kinetic within a wide temperature range: 62.6 – 86F. This strain has low volatile acidity and acetaldehyde production under suitable nutritional conditions. It improves the softness and roundness of full bodied wines. You can count on the production of complex aromas that combine with oak flavors to create a very original organoleptic profile that can bring character to the lightest wines. It is recommended for the vinifications of high quality red wines aged in oak barrels and is particularly adapted to the production of red wines from Cabernet, Merlot and Shiraz grape families and to all full bodied wines. Also recommended for long maceration processes with grapes rich in astringent tannins.